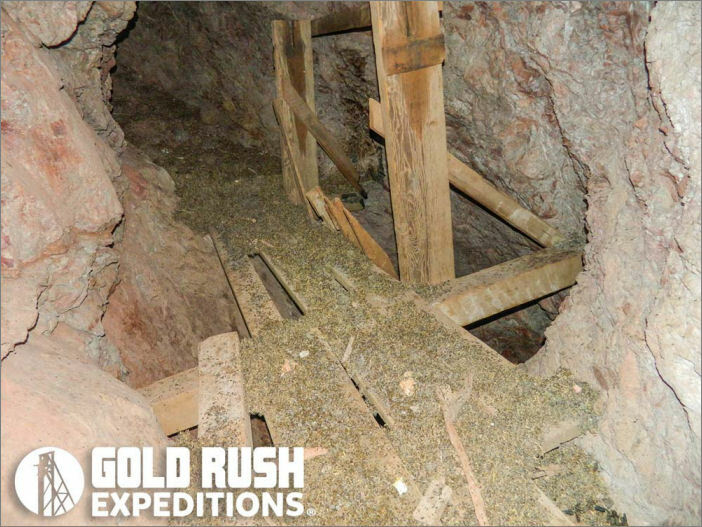 The Yellow Breast Gold Mine is located in the low hills of the Gila Bend Mountains. 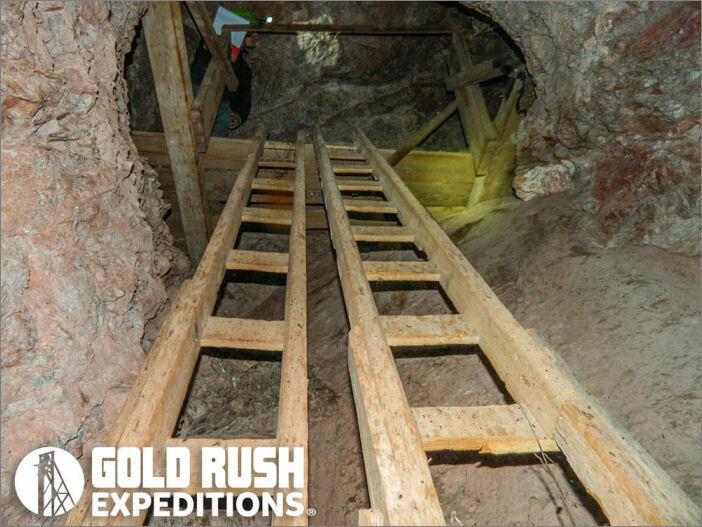 A range well documented for native gold deposits and large nuggets. 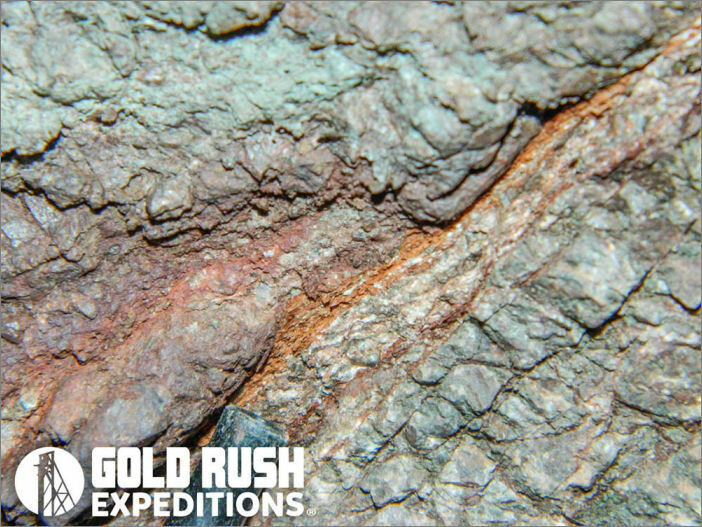 In addition to the main workings, there are other interesting outcroppings on the claim that show copper and flake gold. The mine is cut into an andesite dike flanked by breccia, talus, and a wide sheared, alteration zone. This structure is documented for hosting a gold-bearing quartz veins (reports of a 2.5 ft wide veining striking ENE with a dip of 50 degrees). 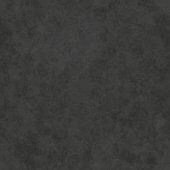 Quartz veins are described as irregular lenses of quartz with alternating streaks of black iron oxide several inches thick. Other minerals include galena (partially altered to anglesite), cerussite, pale-green crystalline fluorite, and small amounts of wulfenite and yellow lead oxide within fractures. Wall rocks contain considerable sericite, quartz, and chlorite. Native gold is reported in quartz lenses and veins with heavy iron oxidation. The Yellow Breast Mine is about 3/4 mile northeast of the Bill Taft workings. Here, a gravel-mantled pediment locally exposes calcareous schist that strikes S. 30 degrees W., dips nearly 90 degrees, and is marked with chert bands up to 1/4 inch wide. A fault zone that strikes and dips with the schist contains a vein, about five feet wide, of brecciated, iron-stained, dull-brown quartz. Two vertical shafts, about 45 feet deep, show that this vein contains a few irregular bunches of galena, partly altered to anglesite and cerussite, in a gangue of pale-green crystalline fluorite. A little wulfenite and yellow lead oxide occur within fractures and small cavities in the quartz. There is free gold visible in some quartz lenses, also smaller amounts in the veins. The site has obviously changed since 1933 and one of the shafts has been backfilled. The other decline cuts in at a 40 degree angle and levels out on a drift level at 130’. The drift is roughly 100’ and does not intersect with the other decline as would have been expected. The Yellow Breast Mine is marked by dark brown and black waste dumps around the general area of the mine. The primary entrance is a decline adit which drops at an angle of about 40 degrees. It's steeper than it looks. The mine runs down at this angle for roughly 130 feet before leveling out into a drift level. Minimal work completed in the decline, the main work being done on the 130' level. This drift level has veins mapped by paint and core samples. Some core samples were noted with native gold in quartz, in a short winze. Additionally, Galena and some likely copper occurring as azurite. The mine is stable and solid, cut into hard rock. It's a tall and wide shaft, more indicative of later cuts which lead to an estimated date of 1935 for the cut. The air is good throughout. No evidence of anyone being in here, at all. There are a few bats in the lower winze and we noted a large owl has nested up about 40 feet into the mine portal. Writings inside the mine indicate there was some activity in 1951 and 1972. Hand cut pick marks at the face of the mine infer that all of the work completed was done by hand. Native gold deposits are present and visible. 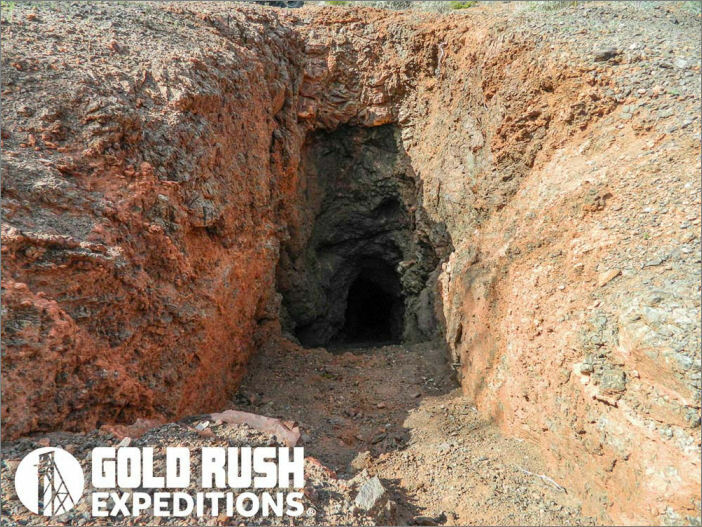 The mine is located on an unused old trail that sees little to no traffic. There are no indicators of the mine site which would make it visible from a distance. The mine is spread out over a large area and mostly flat with the exception of some dozer cuts which were likely done with the reclamation to spread out the waste dumps. There is substantial room for parking and staging equipment on the property. Roads are in good condition but occasionally suffer from wash outs and deep, sandy gulches. Two wheel drive is sufficient in dry weather but any inclement weather will require 4WD. High clearance is recommended for sandy sections.